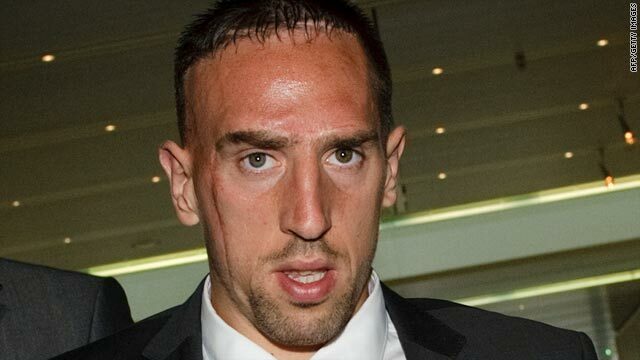 Franck Ribery leaves UEFA headquarters in Nyon after losing his appeal against a three-match European ban. (CNN) -- Bayern Munich playmaker Franck Ribery will miss the Champions League final against Inter Milan this month after failing in his appeal against suspension on Wednesday. The France international was handed a three-match ban by European football's governing body UEFA for his sending-off in the first leg of the semifinal against Lyon last month. He was initially given an automatic one-game suspension for the straight red card, which came for a challenge on the French club's Argentine forward Lisandro Lopez in Munich on April 21. That was extended by another two games by UEFA's control and disciplinary panel on April 28, meaning the 27-year-old had to miss the final as well as the second leg, plus the first Champions League match of next season. Video: Who will win the Champions League? Ribery's German employers announced after Wednesday's announcement in Nyon, Switzerland, that they would take the matter to the Court of Arbitration for Sport, the UK Press Association reported. PA said Bayern chairman Karl-Heinz Rummenigge had told reporters outside UEFA headquarters that the club would go to CAS in order to have Ribery available for the final in Madrid on May 22. "Franck Ribery, as well as our in-house counsel Dr Gerlinger, have in my view put an impressive case to the court that we are not dealing with violent conduct but merely a foul," Rummenigge said in a statement. "The committee rated this case as a borderline case. Nevertheless the three-person committee unfortunately did not follow FC Bayern's plea. We are very disappointed by this judgment and still cannot comprehend that this foul was judged as violent conduct. Coach Louis Van Gaal's Bayern players are seeking to win three trophies this season, leading the domestic Bundesliga title race by three points going into Saturday's final match at bottom club Hertha Berlin and having also qualified for the German Cup final.